A Monday report from the Congressional Budget Office estimated some 14 million more people would be uninsured under the House GOP's proposed American Health Care Act by 2018 than under current law -- an analysis causing disturbance among Senate Republicans and Democrats. Democratic leadership was quick to point to the CBO report as evidence that the American Health Care Act will not cut it as a solid Affordable Care Act alternative. "The bill's in trouble," Senate Minority Leader Schumer said during a Capitol press briefing on Tuesday. "It's in trouble in the House; it's in even more trouble in the Senate; and we Democrats are unified [in opposition]." In a Monday evening statement, Senate Majority Leader Mitch McConnell said the takeaway from the nonpartisan CBO report was clear in that "the American Health Care Act will ultimately lower premiums and increase access to care." The House leadership Obamacare Lite plan has many problems. We should be stopping mandates, taxes and entitlements not keeping them. Their plan keeps the Obamacare "Cadillac Tax" forever, which is a tax on the best health insurance. While McConnell has previously said senators will have a chance to amend the AHCA before it is brought to the Senate floor for a vote, but Republicans nonetheless expressed concern with Monday's report in public fashion. "At the end of the day we should pause and try to improve the product in the light of the CBO analysis rather than just rejecting it," Sen. Lindsey Graham (R-S.C.) said on Tuesday. The CBO report's analysis that up to 24 million could go uninsured within a decade under "Trumpcare" primarily stems from the AHCA's changes to the Medicaid program. The current draft of the bill both caps sum federal spending for the Medicaid program and halts extra federal funding for Medicaid expansion. This, so the CBO report says, would result in millions more people going without coverage. Sen. John McCain (R-Ariz.) said he'll wait to see the House's final draft they send to the Senate, but expressed that he was "always" worried about and focused on individuals losing their health care coverage. 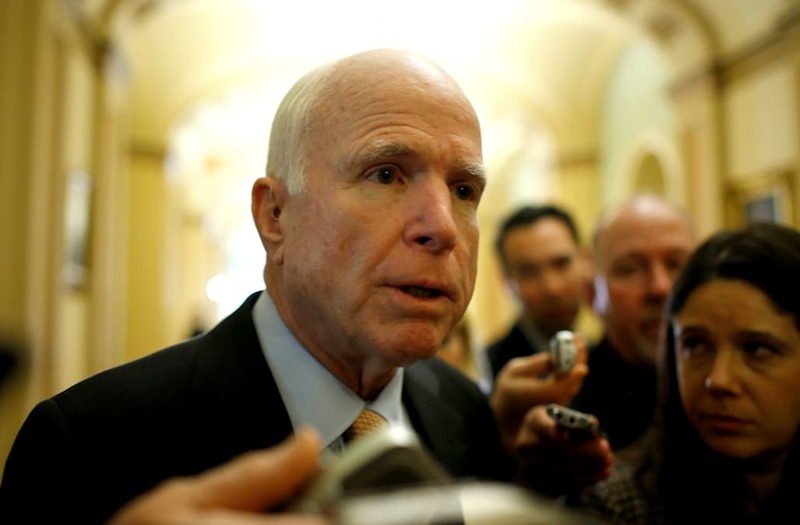 "I'm concerned more ...[about] what the House bill will do to Arizona especially since they expanded Medicaid," he said. One element of the CBO score that some GOP leaders are touting is the notable estimate that the plan would result in a national budget deficit reduction of $337 billion over the course of a decade. House Minority Leader Nancy Pelosi doesn't buy that argument, though, and says these savings come "at the cost of many lives." "They're saving $33 billion a year ... and are cutting off 26 million people from healthcare. It's just not a good investment," Pelosi said on Tuesday. "Of course you have savings if you cut off millions of people from access to care." Schumer also used Senate Republican divides over the AHCA as a scapegoat to show the bill will not stand a chance at passing Congress. Tea Party Patriots supporters hold signs protesting the Affordable Care Act in front of the Supreme Court as the court hears arguments on the health care reform bill on Tuesday, March 27, 2012. Affordable Care Act supporters wave signs outside the Supreme Court after the court upheld court's Obamacare on Thursday, June 25, 2015. A man holds signs during a protest on the second day of oral arguments for the Patient Protection and Affordable Care Act in front of the U.S. Supreme Court building on March 27, 2012 in Washington, DC. Today is the second of three days the high court has set aside to hear six hours of arguments over the constitutionality President Barack Obama's Patient Protection and Affordable Care Act. Sister Caroline attends a rally with other supporters of religious freedom to praise the Supreme Court's decision in the Hobby Lobby, contraception coverage requirement case on June 30, 2014 in Chicago, Illinois. Oklahoma-based Hobby Lobby, which operates a chain of arts-and-craft stores, challenged the provision and the high court ruled 5-4 that requiring family-owned corporations to pay for insurance coverage for contraception under the Affordable Care Act violated a federal law protecting religious freedom. An Obamacare supporter counter protests a Tea Party rally in front of the U.S. Supreme Court in the morning hours of March 27, 2012 in Washington, DC. The Supreme Court continued to hear oral arguments on the Patient Protection and Affordable Care Act. Affordable Care Act supporters hold up signs outside the Supreme Court as they wait for the court's decision on Obamacare on Thursday, June 25, 2015. Ron Kirby holds a sign while marching in protest of the Patient Protection and Affordable Care Act in front of the U.S. Supreme Court on March 26, 2012 in Washington, DC. Today the high court, which has set aside six hours over three days, will hear arguments over the constitutionality President Barack Obama's Patient Protection and Affordable Care Act. A protester waves his bible in the air as he overpowered by cheers from supporters of the Affordable Care Act as they celebrate the opinion for health care outside of the Supreme Court in Washington,Thursday June 25, 2015. The Supreme Court on Thursday upheld the nationwide tax subsidies under President Barack Obama's health care overhaul, in a ruling that preserves health insurance for millions of Americans. Nuns, who are opposed to the Affordable Care Act's contraception mandate, and other supporters rally outside of the Supreme Court in Washington, D.C., U.S., on Wednesday, March 23, 2016. On Wednesday morning, the Supreme Court is scheduled to hear oral arguments in Zubik v. Burwell, a consolidated case brought by religious groups challenging a process for opting out of the Affordable Care Act's contraception mandate. Supporters of contraception rally before Zubik v. Burwell, an appeal brought by Christian groups demanding full exemption from the requirement to provide insurance covering contraception under the Affordable Care Act, is heard by the U.S. Supreme Court in Washington March 23, 2016. Protestors hold placards challenging 'Obamacare' outside of the US Supreme Court on March 4, 2015 in Washington, DC. The US Supreme Court heard a second challenge to US President Barack Obama's Affordable Care Act. The US Supreme Court faces a momentous case Wednesday on the sweeping health insurance reform law that President Barack Obama wants to leave as part of his legacy. The question before the court is whether the seven million people or more who subscribed via the government's website can obtain tax subsidies that make the coverage affordable. A ruling is expected in June. Linda Door (L) protests against President Obama's health care plan in front of the U.S. Supreme Court Building on March 26, 2012 in Washington, DC. Today the high court, which has set aside six hours over three days, will hear arguments over the constitutionality President Barack Obama's Patient Protection and Affordable Care Act. Supporters of the Affordable Care Act celebrate after the Supreme Court up held the law in the 6-3 vote at the Supreme Court in Washington June 25, 2015. The U.S. Supreme Court on Thursday upheld the nationwide availability of tax subsidies that are crucial to the implementation of President Barack Obama's signature healthcare law, handing a major victory to the president. "There are, I think, more than 10 Republican senators, some very conservative, some more mainstream, who say they don't like the bill," Schumer said. President Trump's Health and Human Services Secretary Tom Price said on Monday that the CBO report is "just not believable," and insisted that the Republican Obamacare replacement plan will insure a greater amount than those currently insured. "It should prompt the House to slow down and reconsider certain provisions of the bill," Sen. Susan Collins (R-Maine) said of the CBO report in a statement -- which also noted the report should be a "cause for alarm" among lawmakers. "We need to spend the time necessary to get this right."